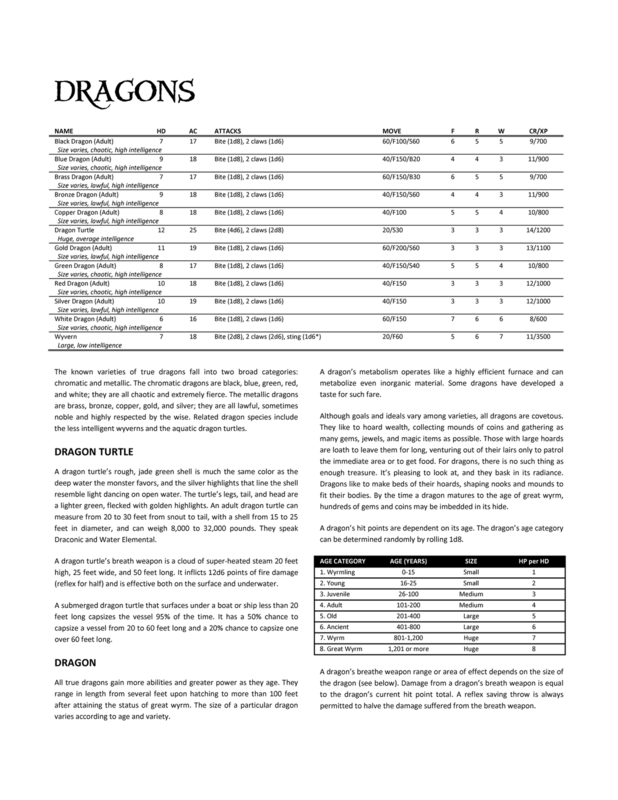 While this is a preview of the dragon stats in Blood and Treasure, it is really more of a question that I’m posing to you, the reader, about the format of the monster chapter in the book. 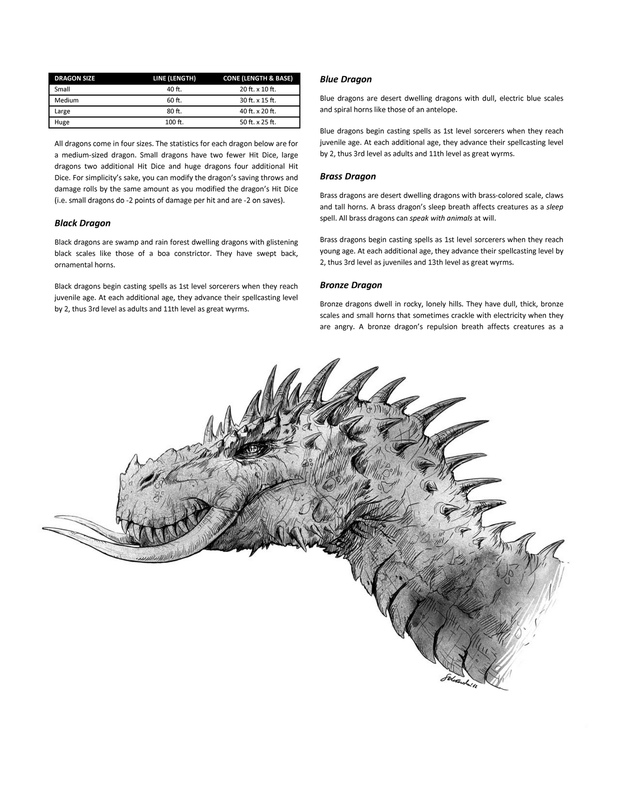 Initially, I intended to do a fairly straightforward layout – monster name followed by a little table of stats and then the monster description. The same basic layout that has been used for generations in fantasy RPG’s, from Moldvay to the various Monster Manuals. 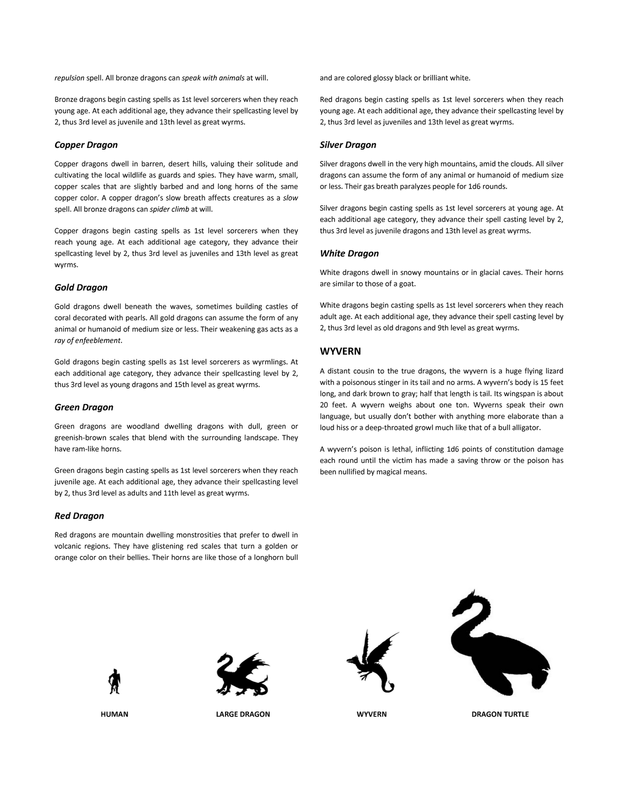 Yesterday, I started thinking about doing something a bit different – somewhat inspired by the layout that I think they used in the earliest versions of the game – a table grouping all of the monster stats together, and then the monster descriptions below that. You’ll notice some silhouettes of monsters from Telecanter, the most excellent master of silhouettes in the OSR blog community, if not the world, to show the size comparison. I decided to give it a whirl using the monsters of the “dragon” type in the game. It still needs a little work (I need to include the organization information for the monsters – probably as a line beneath the description), and I need to play with the stats a bit, but I think it just might work. Printed out, it is very readable, and might make scanning for stats a little easier for the busy Referee. ← Big Announcement in the World of Fantasy RPGs! I like it! Nice, clean readable layout, but then excellent design is a a trait of all of your work. The addition of the silhouettes is a great touch. I second Trey in praising this layout and the use of the silhouettes (something more games should consider for human/monster size comparison). Very nice. Clear and practical. It may make it a little table-heavy on the first page, but I would consider trying to find a way to get that third table to the front. It looks like a good balance of flowing text to not-flowing-text (tables and pictures); you don't have a big WALL OF TEXT to make it tedious. Thanks – it's already been tweaked a little bit as I'm doing other monster types and finding a need to adjust things. I'm about halfway done with re-jiggering the monster info into this format.